A windfall lands on your lap, and that’s what I call a good problem. But it’s a problem nonetheless; should you use it to pay off your mortgage, invest in stocks or in your business? Should you upgrade your car, buy new furniture or take your family for that dream holiday? 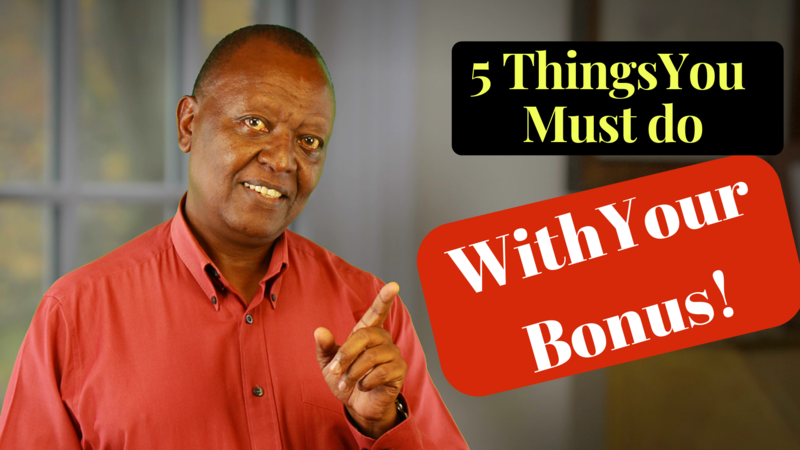 Today, we consider the top five things you should do with your bonus. Most of us come to this cross roads at some point in life, where we come across some excess money. The most appropriate course of action is determined by one’s financial situation, goals and values. The first good use of a bonus is paying off debt. If one has debts, these can be categorized into two types one with high rate of interest and second with lower rate of interest. Mobile phone loans, microfinance company loans, credit cards and any loans which have fallen into arrears belong to the first category, they demand higher rate of interest, sometimes extremely high, and hence when an individual who has this kind of debt come across a windfall, it is only advisable for him to go ahead and pay them off. In case of the second category of debt, such as mortgages and sacco loans, which is lower interest rate then it, is advisable to pay them off or to invest? I recommend that you take two things into consideration – a. What is the rate of return of the investments you are considering? b. What is the rate of interest of the various debts? Only if an individual can convince himself that the interest rate on the debt is higher and that paying off the debt would help him to reduce some of his burden and thereby increase the monthly amount saved, then and only then should he pay the debt. The second use of your windfall to consider is setting up or boosting your emergency fund. Emergency savings are liquid funds that stand ready and available for use at a moment’s notice in the event of a financial emergency such a car breakdown. One should have money enough for approximately six month’s expenses in such a fund to smoothen out life’s unexpected glitches. Without an emergency fund, each unexpected snag becomes a full blown crisis that will force you to borrow expensively or sacrifice necessities. If you do not have an emergency fund, a windfall is an opportunity to rectify that situation even before you invest. The third good use of a bonus is to ensure you have adequate personal risk management in place. Here, I am referring to life insurance cover and health insurance. Do not be lulled into a false sense of security because you have employer provided cover. Find out exactly how much such coverage is and consider whether it is appropriate for your needs. If not, use your bonus to upgrade the cover. The forth good use of the windfall is to invest. What to invest in will depend entirely on your circumstances and your goals. You can boost your retirement funds, invest in your business if you have one, you can put money into your children’s education investment, use the windfall to start or accelerate you journey in real estate investment, farming or any other investments that fit your situation, goals and abilities. The more money you invest, the more you ensure your future financial security. The fifth use of windfall income is to celebrate. Whether you want new clothes, furniture, car upgrade, holiday or whatever catches your fancy, as long as you have considered the first four uses of your windfall, you deserve to celebrate. So knock yourself out, enjoy without guilt!